Scroll down for this month’s answers, and be sure to leave your question for me at the end! Try looking for a pair that’s cut low around the ankle; this small detail will help elongate your legs. A couple of other things to keep an eye out for are the thickness of the sole, and buying thin shoe laces rather than thick bulky laces. As far as styling the sneakers, opt for one color head-to-toe for a flattering look. You can also tuck in your shirt to accentuate your waist and help you look longer. Scroll to shop my picks and some outfit inspiration! Start by figuring out how many outfits you’ll need for the trip, and strategically plan each look before you put anything in your suitcase. I always try on and photograph each outfit I’ve planned so I know exactly what to wear on my trip. This saves time and ensures that you’re only bringing the essentials. Since you’re traveling to two different climates, try planning outfits with versatile pieces you can mix and match. A breezy jumpsuit or a lightweight dress are great options you can wear in both climates and easily throw on a jacket or scarf while in the colder location. And for the 14-hour flight? 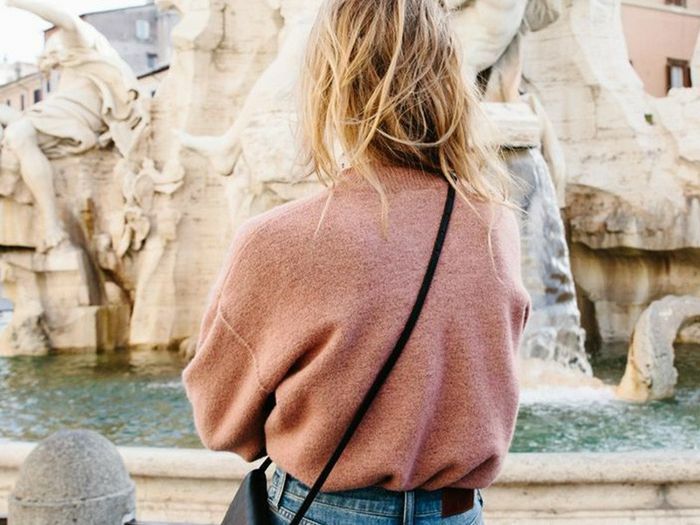 You can’t go wrong with wearing your comfiest jeans and and a great sweater. Topshop has an awesome selection of bomber jackets, so nice pick. To help inspire your next look, I've gathered my favorite ways to style the on-trend jacket. Scroll down for different ways to wear your new bomber!